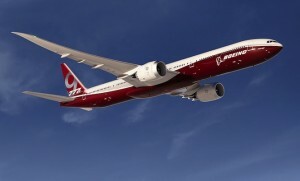 The formal launch of the 777X range breaks nearly a year of anticipation. On the back of an Emirates order for 150, Boeing has formally launched its much-anticipated 777X program, announcing program go-ahead, appropriately enough, at the Dubai Airshow on Sunday. In all Boeing has received a record-breaking number of customer orders and commitments for the newest member of its twin-aisle, with agreements for 259 aircraft from four customers across Europe and the Middle East provide a strong foundation for development and production. Representing what the manufacturer says “is the largest product launch in commercial jetliner history by dollar value”, 777X orders and commitments include Lufthansa with 34; Etihad with 25; Qatar Airways with 50 and and a colossal order from Emirates for 150 aircraft. The combined value of the agreements is more than US$95 billion at list prices. The 777X family includes the 777-8X and the 777-9X, the former competing directly with the A350-1000 at 350-seat capacity and 9,300nm (17,220 km) range, while the latter opens new growth opportunities for airlines with its 400-passengers capacity. With a range of more than 8,200nm (15,185 km), the aircraft will have the lowest operating cost per seat of any commercial aircraft, Boeing claims. The 777X introduces the General Electric’s new GE9X and an all-new high-efficiency composite wing that has a longer span than today’s 777. The 777 family, which today commands 55 percent of market share in its category in terms of order backlog. Boeing also claims the 777 holds 71 per cent of the in-service fleet worldwide.